An independent price and caffeine comparison study of the UK’s best known coffee brands has revealed Costa as the best choice for coffee drinkers in search of the high street’s biggest caffeine rush. The cost and caffeine content of a standard 12 fl.oz. cup of Americano coffee was compared by money saving website Voucherbox.co.uk at the UK’s most popular coffee shops, with Costa providing the highest caffeine level overall, at 195mg per serving, and the best price per 100mg of caffeine (£1.00). At the other end of the scale Caffè Nero coffee contained the lowest caffeine content for a 12 oz. Americano (80mg), which makes it the most expensive outlet in the study for getting a caffeine hit (£2.56 per 100mg of caffeine) – two and half times more expensive than Costa. Greggs was the second best retailer for cost versus coffee strength, at £1.06 per 100mg coffee, followed by Pret a Manger (£1.30 per 100mg of caffeine) and Starbucks (£1.40 per 100mg of caffeine). 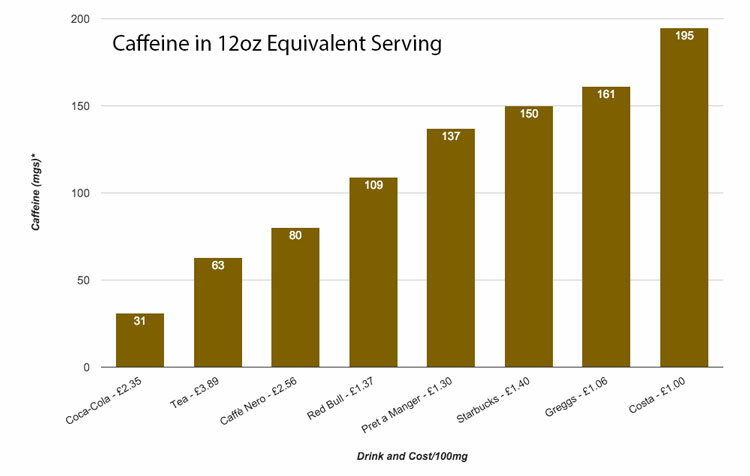 The research also looked into the cost of caffeine if consumed by drinking Coca-Cola, Red Bull and a good old fashioned cup of tea, with Red Bull fairing well in the comparison table and the claim that ‘there’s more caffeine in tea than coffee’ well and truly dismissed. The difference in caffeine levels amongst the main coffee shops relates to factors such as the number and size of espresso shots in each serving, the blend of bean used and the preparation method in each case. Cost alone may not always be the dictating factor in where the caffeine thirsty consumer heads for their drink, but understanding the varying caffeine levels per brand or drink helps coffee aficionados calculate a healthy intake limit. The European Food Safety Agency state 400mg as the recommended maximum daily caffeine level. For pregnant women they are advised to keep caffeine intake to a maximum of 200mg per day. You can see an infographic related to this research on the Verything blog here and you can look at our regularly updated Starbucks vouchers here.